Semi-Auto Miter Cutting Band Saw (CF-450M) - Big Stone Machinery Co., Ltd.
Big Stone Machinery Co., Ltd.
(1) HSS Saw blade 1 pc. (2) Tools with tool box. (1) 2 meter roller table. 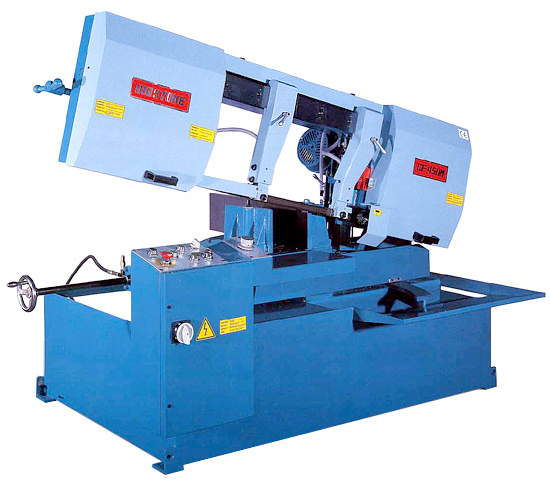 Unique mitre cutting design which allows cuts from 0°-45° by swivelling the head of the machine. The angle is set accurately with the aid of a graduated scale. 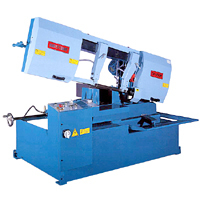 Hydraulic vice clamping which saves the operator time and energy and increases blade life. Vice bed fitted with hardened and ground wear strips to maximise life and accuracy. The machine automatically raises to the top position at the completion of the cut. Heavy duty blade tension unit with indicator to alert operator of correct tension. Fitted with 34mm wide blade for cutting larger sections.